Mantabuan Island is another little gem in the Celebes Sea. It is mainly famous for it’s black coral bushes but is also known to get regular manta ray and eagle ray visits. This volcanically formed island has black coral bushes in shallower depths than most other dive destinations. Normally it’s necessary to dive to 40 metres or beyond but at Mantabuan Island fine examples can be found in just 23 metres of water. Black Coral Garden dive site has some of the finest examples of black coral bushes in various colours including white and purple (only the skeleton is black). Other soft corals, seafans, sponges and a myriad of reef fish make this truly a beautiful dive site. Stingray Alley is home to blue spotted stingrays and blue spotted ribbon rays. Also look out for blue ribbon eels and lots of nudibranchs. 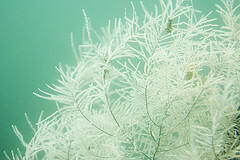 Soft corals are very impressive on this dive site. Star Point is a shallow dive to 15 metres with perfect hard and soft corals that are home to large schools of fish including angelfish, bannerfish, butterflyfish, parrotfish, snapper, fusilier and wrasse. Turtles are common. Moray eels, lionfish, scorpionfish and as always, hundreds of nudibranchs and shrimps can be found. The Channel, to the south west of the island can get strong currents which attracts manta rays and eagle rays.